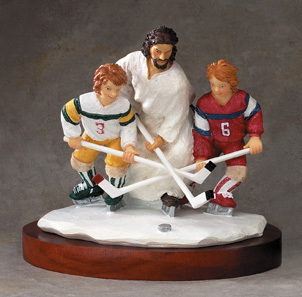 Is youth sports your God? Wyman Richardson, a Baptist minister in Georgia, is asking some questions of his fellow Christians so they themselves can discover what they value more: their faith or sports. As you might have guessed by the foreshadowing in the previous paragraph, Richardson is hardly the first Sunday-oriented religious leader to notice that the pews got a little emptier whenever youth sports kicked into higher gear. Of course, Christianity for years had the advantage, unlike other faiths, of blue laws to mandate there was nothing to do on Sunday but go to worship, so until recently it hasn’t had to deal with the competition. Pope John Paul II, so much of an athlete that he’s under consideration to be the Catholics’ patron saint of sports, in 2004 felt the need to remind his flock that Sunday was God’s day, not just another day for sports and entertainment (youth and otherwise). Inspired by that message, the priest at the Catholic church affiliated with my basketball league stopped us from having games on Sunday, even though attendance by men, oh, quadrupled because they would show up with their hoopin’ shoes for a little pregame Mass, when otherwise they would have not shown. My own church’s pastor has led movements to keep Sunday event-free, and she isn’t Baptist or Catholic or Dutch Reformed (the faith of one of my 10-year-old daughter’s softball teammates, who never plays on Sunday). She’s with the United Church of Christ, where they’ve let gays be pastors since 1972. Of course, Christianity for years had the advantage, unlike other faiths, of blue laws to mandate there was nothing to do on Sunday but go to worship, so until recently it hasn’t had to deal with the competition. The demands of travel sports, the fear that missing a practice could mean the end of the college scholarship dream, or the simple joys your child has in playing a sport — Richardson gets that. “My point is not that your child should always choose a church event over an athletic event.” What he’s wondering is, hey, parents, are YOU getting so much of a rush out of your child’s sports that you are unwittingly sending the message to your child that sports is the most important thing, that the sports tail SHOULD be wagging the family dog? The questions Richardson asks demand soul-searching for your answers, no matter whether you’re Christian, Jewish, Muslim, Baha’i or Richard Dawkins. Which is a more exciting thought to you: your child receiving an MVP award for his team or your child leading a friend to faith in Christ? How excited do you get about the big game? How excited do you get about corporate worship? If your child routinely asked to stay home from practice, would you speak with him/her about “commitment”? If your child routinely asked to stay home from church, would you speak with him/her about “commitment”? There is an easy answer to a lot of these questions: if you miss church, there’s always next week for the rest of your life. If your child misses sports, that narrows an already small window of opportunity. But is that really the right reason? Richardson’s questions, even if you’re comparing, say, music with school rather than sports with church, do raise a little spiritual food for thought about how healthy it is for you and your family to tie your schedules to your child’s pursuits. Particularly if you have, even in the back of your mind, the thought that this is all going to lead to that magic scholarship or pro career, despite the overwhelming odds otherwise. After all, it’s easier for a camel to go through the eye of a needle than your child to go pro.